Our baby is getting so big. 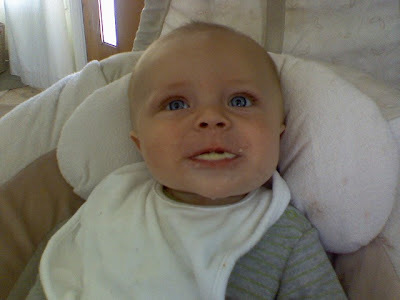 He has started to eat solid foods, and surprise! He loves them! He has only tried cereal so far, but its a fun start. Sorry that you can see the food in his mouth. Kinda gross! We'll teach him to chew with his mouth shut later! Sorry, I'm kind of obsessed with the day-to-day things that my kids do. That's just the stage of life that we are in. That's what is exciting in our family right now. Rach- I love seeing your kids. Q is so big! Wowza. Q looks so cute! I can't believe he's getting so big! Rach your kids are so cute!! I found your blog through Liz. How are you doing? I haven't talked to you forever. he is soooo cute!!! we started feeding boston the rice cereal this week too, mostly because if he didn't go back to sleeping through the night, i was going to go crazy! it worked like a charm! these two kids would be good friends. they could roll around together! quince is so stinkin' cute! Don't apologize...the day to day stuff is what I love to read about. It's good to know that everyone goes through the same stuff and it's fun to see everyone's kids growing up. Your kids are so beautiful, by the way! Q looks so dang cute. i am so glad you are blogging so that i can see pics! hey!!! so... my little sister dropped in on us this morning. apparently she's in town! :) still single! your brother? maybe we should get them together tonight! call me! (leave me a message if i dont answer. we all know how good i am at answering phones or returning calls!!! :) her name is noelle and her number is 702-279-2949.